Summary of Case: Allegations of abuse by Schroeder between 1947-75 at Holy Family church were made public 8/18/07. Bishop Gettelfinger stated that he knew of allegations in 1996 but recently learned that the "scope is greater than we knew." Schroeder founded the parish and the affiliated Boy Scout troop, and would often take boys hunting and camping. By 8/31/07 claims of abuse of at least 10 boys and girls had been received. Schroeder died on 2/16/88. He began as a priest of the then-diocese of Indianapolis. His 1st parish was in Lawrence IN, near Cincinnati, now in the archdiocese of Indianapolis. See below for the allegations and press coverage. Incardinated: Diocese of Indianapolis, 1938-44; Diocese of Evansville, 1944-88. Bishop was Joseph E. Ritter. Lawrenceburg IN 2/2. Priests were Msgr. William Kreis, who was also the rural dean of the Lawrenceburg area and a member of the 5-priest Building Commission, and Schroeder. In the Indianapolis diocese. Now in the Indianapolis archdiocese. Parish school had 168 pupils in 1938-39. Boonville IN 2/2. Priests were Rev. August Fichter and Schroeder. In the Indianapolis diocese. Now in the Evansville diocese. Red Brush 2/2. Fichter and Schroeder. Mission attended from St. Clement's. Chrisney IN 2/2. Fichter and Schroeder. Mission attended from St. Clement's. 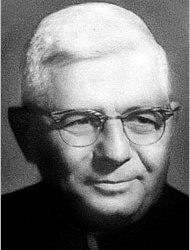 When Evansville diocese was established on 12/19/44, Henry J. Grimmelsman (1944-65) was the 1st bishop. Jasper IN 4/4, 3/4, 2/4, 2/5. Priests were Revs. Leonard Wernsing, Roman P. Heerdink, Leo Schafer, and Schroeder. In 1943, Wernsing was made pastor, Schafer left, Schroeder became #3, and Rev. Maurilius Bilskie arrived. 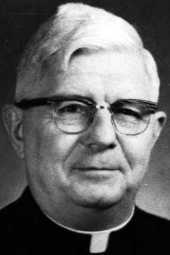 When Evansville diocese was established in 1944, Wernsing became dean of the Jasper deanery and head of school board. In the same year, Schroeder became #2 and Heerdink dropped to #3. In 1945, Rev. John Finis replaced Heerdink. In 1946, Rev. J. John Vincius replaced Bilskie.In 1947, Finis left, Vincius became #3, and Revs. Paul Stone and Ralph Endress arrived. In 1950, Rev. John Emge replaced Endress. Wernsing died 1/31/51 and was replaced by Very Rev. August B. Fichter as pastor and dean. Fichter was Jasper dean through 1973. In the Indianapolis diocese; part of the Evansville diocese when it was created in 1944. Parish school had 794 pupils in 1942-43. It had 945 pupils in 1950-51. 1973 Synodal Examiner Evansville IN In 1948, Msgr. Leonard Wernsing took over as 1st synodal examiner, with Revs. John C. Rager, Raymond Smith, William Bastnagel, Clarence Lindauer, William Lautner, Schroeder, Maurilius Bilskie, and Lawrence Moll. Only Rager and Bastnagel were carried over from the previous group. Synodal examiners are no longer listed in the 1974 Directory and subsequent volumes. • Bishop Gettelfinger received allegations in 1996 about Schroeder but kept them secret. After receiving other allegations, he made them public on 8/18/07. Others came forward, totaling more than 10 in this parish by 8/30/07. See statement and article. For confidentiality agreements in other cases, see article. and editorial. IN 1/1, 1/2. Founding pastor. In 1961, Rev. Donald Spaulding joined as #2. In 1962, Rev. Joseph Anders replaced Spaulding. In 1968, Rev. Walter Rinderle replaced Anders. In 1969, Rev. John Kane replaced Rinderle. Kane became the Jasper-area supt. of Catholic schools in 1971 and a defender of the bond in 1973. Rev. Albert Scheller replaced Kane in 1973. Parish school had 224 pupils in 1951-52; and 427 pupils in 1961-62; and 536 pupils in 1971-72; and 482 pupils in 1974-75. In the 1966 Directory, Holy Family begins to be listed first of the by-then 3 Jasper churches. 1963 1968 Magister Noster Latin School Evansville IN Schroeder and Rev. Charles Kaiser were the 2-priest Committee on Discipline for the new school, with Rev. Jerome Neufelder added in 1967. Headmaster was Rev. Donald C. Dilger. Members of other committees were Revs. James F. Hill and Robert A Deig (finance); Clarence A. Lindauer and John Shaughnessy (spiritual life); James Rogers and Roman P. Heerdink (studies). In the 1966 Directory, also named are Revs. Joseph Ziliak (vice-rector) and Rev. William Wargel. The school had 36 pupils and was staffed by 4 diocesan priests, one of whom was Dilger. Revs. David Kissel and John Lefler are named in the 1965 Directory. The school had 74 pupils in 1967-68, and by then is classified as a "preparatory seminary." 1964 1967 Diocesan Consultor Evansville IN In the 1965 Directory, the consultors are Msgr. Herman Mootz (also vicar general), Rev. Charles Schoettelkotte (promotor justitiae, director of Catholic Charities, and other offices); Very Revs. Clarence Lindauer and William Lautner (deans); Revs. Schroeder, James J. O'Connor, and Maurilius Bilskie. These consultors were responsible for the diocese during the transition from Grimmelsman to Leibold. Diocesan Insurance Comission Evansville IN 6/8, with Msgr. Omer F. Meyer #2. Chancellor Clarke was #1. Membership is first detailed in the 1970 Directory. 1972 Monsignor First listed as Msgr. in the 1973 Directory. No school listed, but a convent with 4 nuns. In the 1976 Directory, when Schroeder is first listed in Schnellville, Rev. John V. Foster is first listed as youth minister at St. Joseph's back in Jasper. This assignment record collates Schroeder's career history as it is represented in the Official Catholic Directory with allegations as stated by Bishop Gerald A. Gettelfinger and reported in the media. We make no representation regarding the truth of the allegations we report. We remind our readers that in the U.S. judicial system, a person is considered innocent until proven guilty. This assignment record was last updated on August 31, 2007.